Our pick for the best Nuttery Bird Feeder is the Nuttery NC017 Eclipse Seed Feeder. Not only is this model made with a distinctive design that will make it stand out in your yard, but it’s durable and can feed many birds at once. It’s also squirrel-resistant and can easily be cleaned and filled without problems. For more information on the NC017 seed feeder, see below. The Nuttery NC001 Hexihaus Compact Suet Feeder is our runner-up pick. It’s on the expensive side for its size. However, the Hexihaus provides many great features like a durable metal design and a built-in hopper that can hold up to two suet cakes. It can also be disassembled so you can easily fill it up or clean it out. For more information on the NC001, see our Product Reviews below. While not as big as our top pick, the Nuttery NT056 Round Seed Feeder is still a great choice to consider. It’s painted in a soft green color and has a built-in hopper that’s easy for birds to reach into to grab some seeds. It’s inexpensive, lightweight, and features a nice circular design. For further details on the NT056, see our Product Reviews section below. Birds are a beautiful part of nature. Not only are they stunning to look at and watch, but they provide beautiful songs for us to listen to. Their songs help us feel alive! Many of us try to find ways to invite birds into our yards, especially with bird feeders, bird baths, and bird houses (and don’t forget the bat houses, too!). However, when it comes to shopping for bird feeders there are a variety of options you can choose from which might make it a little difficult to find the right model for your yard. 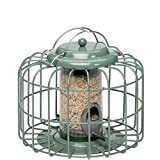 One of the top brands of bird feeders for style and function is Nuttery. Founded in 1990 by Architectural Designer Leslie Lipton, Nuttery Bird feeders are stylish, whimsical, and specifically designed to thwart squirrel intrusion. They are sold in high-end garden stores around the world, and also on Amazon. We love the designs, and think you’ll find some great options to invest in like our top pick, the Nuttery NC017 Eclipse Seed Feeder. It provides many great features, like extra feeding holes and squirrel-resistant technology, to ensure the birds enjoy eating in your yard. To learn more about this product and some other great picks, keep reading. You’ll find some helpful information below. To ensure that the birds get maximum enjoyment and safety out of their bird feeder, be sure to hang your feeder in an appropriate location and clean it regularly. See our guide to hanging bird feeders for more information on bird feeder care and maintenance. Shopping for a Nuttery Bird Feeder isn’t difficult, although there are a few key things you’ll want to keep in mind. Below are some aspects to consider before investing in a feeder. Unfortunately, it’s well-known that squirrels also enjoy eating out of bird feeders. This can end up discouraging the birds from eating at the feeder as well as making a huge mess when the squirrels try to get to the seeds inside. And of course, they eat all the precious seed! Nuttery Bird Feeders are specifically designed to be squirrel resistant, and the cages surrounding the feeders present a challenge to even the most persistent squirrel. However, a squirrel baffle will only increase the squirrel protection, and we definitely recommend you pick one up. 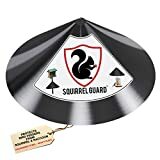 WIDE 17 INCH DIAMETER - Wrap around squirrel baffle quickly attaches to existing bird feeder poles or shepherd hooks (1/2 to 1 inch diameter). Also protects hanging bird feeders - all accessories and easy to follow instructions included. SATISFACTION GUARANTEE - We are a family-owned company and stand behind our customers and our products. We guarantee Squirrel Guard will work for you just like it does for thousands of our customers. Try it 100% Risk-Free. If you are not absolutely DELIGHTED with the result we will refund 100% of your purchase. No questions asked. Bird feeders will come in a variety of designs, so it’s important that you consider your preferences when looking for one. You’ll discover that these products come in various sizes, colors, and shapes which make them pretty much a piece of art. Before you buy a Nuttery Bird Feeder, think about your design preferences so you invest in a bird feeder that matches your landscape and taste perfectly. It’s also a good idea to look at the main structure of the bird feeder. Some might be made of plastic, which isn’t the most durable. You should look for feeders that have metal structures, which is the case with all Nuttery bird feeders. These are not only durable but can help to prevent squirrels from getting to the seeds inside. Most bird feeders are designed to function with bird seed, though some are designed around suet. Birds attracted to suet (like Jays, Chickadees, and Mockingbirds) are generally different species to those attracted to seed. Having both styles on hand in the garden can quickly increase the variety of species found in your yard! Another important thing to consider when shopping for a Nuttery Bird Feeder is to see how much seed or suet it can hold. Some models can hold about half a pound of seeds while others can hold many pounds. If you don’t want to have to worry about having to constantly keep refilling the feeder, a large seed capacity might be ideal. However, if you want something small, keep in mind that you might need to refill it often. You’re eventually going to need to fill and clean the bird feeder, as unclean food can lead to diseased birds. This process can be a little tricky depending on the option you invest in. Sometimes bird feeders can be difficult to open or close back up due to strange contraptions you need to figure out. To help prevent this, you’ll want to look at how easy it is to fill and clean the feeder. Look for special clips or screws that can be easily removed so you can adjust the feeder as needed. This way, the feeder won’t be a hassle to use. In this section, we’ll look at five of our favorite Nuttery brand bird feeders in detail. We’ll start with a comparison table to get the lay of the land, and then go in detail into each of the feeders. The NT056 small bird feeder is the perfect option for those looking for a compact model. It’s lightweight and durable, and can easily dispense seeds into the hopper without spilling them out all over the ground. The seed ports are constructed of metal, and can withstand quite a bit of pecking and clawing without deteriorating. The feeder can be disassembled pretty easily, so you can fill the feeder up with seeds or clean it out without driving yourself nuts. This model is also squirrel-resistant, and the cage will act as a barrier to entry for squirrels. Nuttery Bird feeders are among the best at preventing squirrel infiltration, but picking up a squirrel baffle will always help. There is a hook at the top included, which you can use to hang it up. If you’re looking for a stylish and compact bird feeder to invest in, definitely keep the Nuttery NT056 in mind. It’s durable, easy to fill and take apart, and is designed in such a way to help prevent seeds from spilling onto the ground which can attract squirrels. Seed capacity of .53 lbs. The feeder measures 14.2 x 7.9 x 7.9 inches. It can hold up to 1.4 lbs. of bird seed. While a little pricey, the NT065 is a great way to help feed small birds while preventing squirrels from sneaking into the feeder. This bird feeder can hold almost 1.5 lb. of birdseed and has an easy-to-fill hopper so you can add seed to the feeder without problems. 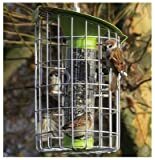 The Nuttery NT065 Classic Seed Feeder features a unique metal design which covers two tubes inside that can hold various types of seeds of different sizes and formats. The ports are made of metal, so they can withstand quite a bit of pecking and scratching by the birds. Some have found that the top on this feeder doesn’t latch sufficiently for their needs, and the squirrels get access to it that way. This bird feeder is a great choice for those looking for a large and stylish bird feeder to add to their yard. It’s good for small birds and gives you the ability to put many different types of seed and food into the feeder for the birds. However, this model doesn’t have as many ports on it which might mean that the birds could crowd around the ports, all fighting to get access to the food. Seed capacity of 1.43 lbs. It’s designed with a sleek gray metal structure. It features a unique slanted roof on the top. There is a clip to help secure the built-in hopper. It can hold up to 1-2 suet cakes. It measures 9 x 10 x 9.7 inches. The feeder weighs about 2.4 lbs. The Nuttery NC001 Hexihaus Compact Suet Feeder comes in a distinctive gray metal design that will help to protect the suet cakes inside from falling out while still making it easy for birds to get to. The bird feeder has a built-in hopper which can be accessed with the clip on the side of the feeder. You can use this clip to open or close the feeder to clean it out or add more food to it. This product can be disassembled safely if you want to give it a thorough cleaning. 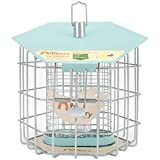 The Nuttery NC001 Hexihaus is ideal for those who want to add a stylish suet cake bird feeder to their yard. It’s durable, beautiful, and doesn’t take up much room. It also is very lightweight and easy for the birds to access. However, this feeder isn’t the most squirrel-resistant of Nuttery’s lineup, so you’ll likely want to pick up a squirrel baffle for this one. It measures 13.2 x 9.1 x 9 inches. The feeder weighs about 1.98 lbs. This model can hold up to 1.61 lbs. of seeds. The Nuttery Roundhaus bird feeder features a stunning green color scheme, as well as a unique design that will help to prevent squirrels from getting to it. It’s very easy to clean and fill thanks to the built-in hopper clip. This clip is located on the top of the feeder and will help to secure the lid to the feeder as well so nothing spills out. The design is pretty similar to the Hexihaus above, though it works with seed as opposed to suet. This lightweight model can hold almost 2 lbs. of seeds, so you won’t have to worry about filling it up often. Just be aware that the perches and portals are made of plastic, and are not as robust as some of the other options on our list today. The Roundhaus bird feeder is an excellent option to invest in, as it can attract many different types of birds. While a little expensive, it’s easy to use and clean so you won’t have to do much work to keep it functioning nicely. However, keep in mind this model might be a little difficult for some birds, especially small ones, to reach due to the size of the metal casing. Seed capacity of 1.61 lbs. The Nuttery NC017 Eclipse Seed Feeder is a very durable option that comes in a stylish blue color and creative “eclipse” design. It’s easy to both fill and clean, thanks to the easy-to-access screw on top of the hopper. The bird feeder has many feeding holes so numerous birds can eat at once. However, these holes are made out of a plastic so they might not be the most durable if pecked or chewed on often. Keep an eye on the condition of the plastic when you clean it. This feeder can hold about 2lb of seed and is also quite squirrel-resistant. While a bit pricey, this feeder is an excellent choice to invest in. It’s stylish, squirrel-resistant, and can feed many birds at once – everything a bird feeder should be. Because of this, it’s easily our top pick for the best Nuttery Bird Feeder. Bird feeders are an excellent way to help encourage many different types of birds to gather in your yard, and Nuttery brand bird feeders are among the best out there! All of these models are great options to consider using in your yard to help attract birds, but definitely keep our top choices in mind. Our top pick is the Nuttery NC017 Eclipse Seed Feeder which is a sleek option that can feed many birds at once. Our runner-up, the Nuttery NT056 Round Seed Feeder, is also a great choice. It’s a compact option that can hold a good amount of seeds. It’s also squirrel-resistant which is very helpful. However, if you’re looking to save a few bucks, you might want to check out our budget-pick, the Nuttery NC001 Hexihaus Compact Suet Feeder. It’s easy to use, lightweight, and features a beautiful design.